Parted red curtains; in the center, in a trench, a German soldier, eyes closed, hands in overcoat pockets, leans against one side of a trench, smoking a pipe, his rifle resting on the other side of the trench. 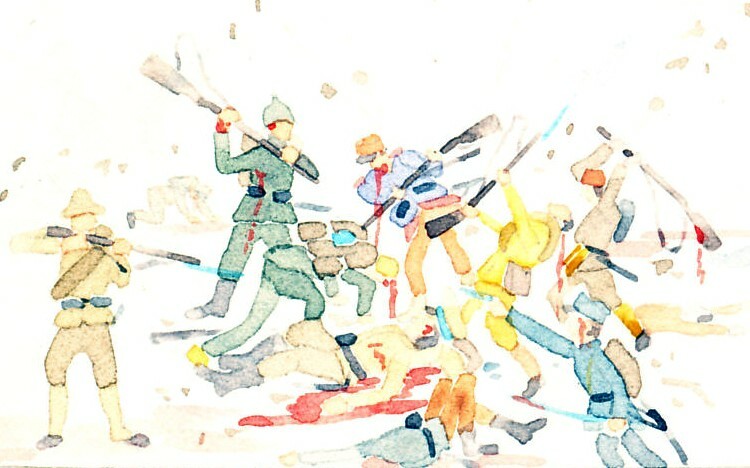 To the right, a Red soldier, red from red fur hat to red boots, holds two rifles. To the left, a Russian soldier casts away his his hat, backpack, and rifle. Across the bottom of the stage it reads, 1918. 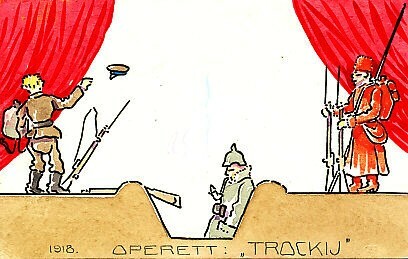 Operett: "Trockij", Operetta Trotsky. A watercolor postcard by Schima Martos.